In my March 1 article on the placement basics of setting up a subwoofer, I noted that there are several advantages to adding a subwoofer to a two-channel system besides just getting deeper bass. The major benefit is that it enables the user to set up the main speakers where they will image best, while at the same time placing the subwoofer where the most even in-room bass response can be achieved. These locations arent always one and the same. Therefore, having a three-speaker system -- two main satellite speakers and one sub -- increases placement flexibility. Of course, a sub covers but a mere fraction of what you hear. It never ventures into the midrange, where lie the character and tonality of instruments and voices. If the satellites dont perform well, the best bass in the world wont make up for it. 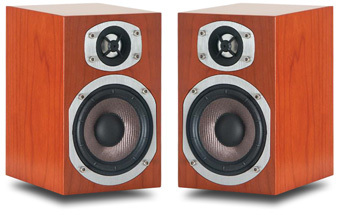 For this review, I listened to a pair of Energys RC-Mini speakers ($400 USD per pair) mated with their S8.3 subwoofer ($350). The RC-Mini is based on Energys Reference Connoisseur line, introduced two years ago. And when I say that its small, I mean small. Each rear-vented RC-Mini weighs just under five pounds and measures 7.5"H x 4.75"W x 6.675"D.
The RC-Mini comes in a choice of real-wood veneers (cherry or rosenut) or glossy piano black. My review pair was finished in rosenut, and to say that they looked impressive is to understate the case. The RC-Mini wont threaten the likes of the expensive, Italian-made speakers from Sonus Faber, but they set a pretty high standard for fit and finish at the price, and looked striking sitting on my 26"-high Osiris stands. The binding posts are topnotch, and make some more expensive speakers posts seem cheap by comparison. The RC-Minis build quality easily warrants its asking price, and when you consider that the veneer is real wood, youre forced to admit that they seem to be a serious bargain. The drivers employ the same technology as used in Energys larger RC-10 and RC-70, both of which have been reviewed on SoundStage!. The 4.5" Kevlar woofer features a cast basket, and uses Energys Ribbed Elliptical Surround technology, which the company claims improves the extension, dynamics, and low-end response while decreasing distortion. The woofer is crossed over at 2.5kHz to Energys Hyperbolic, 1" aluminum-dome tweeter, which is similar in design to the tweeter in the flagship RC-70. Energy rates the RC-Minis frequency response at 80Hz-20kHz, �B, its nominal impedance at 8 ohms (dipping to a minimum of 4 ohms), and its anechoic sensitivity at 88dB/W/m, rising to 91dB/W/m in a typical listening room. Finally, the RC-Mini comes with a mounting bracket for attaching the speaker to the wall, something that speaker makers often charge extra for -- a nice touch. 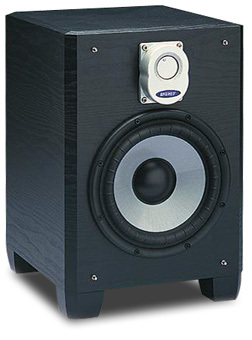 The S8.3 subwoofer is a bass-reflex design with a downward-firing port. It measures 16.38"H x 11.03"W x 14.3"D, weighs 25 pounds, and comes in one of two vinyl finishes. The review pair came in black; the shadow silver finish looks nicer, I think, but neither will win any beauty contests. Thats hardly an issue at $350, but next to the gorgeous little RC-Mini, the S8.3 looks a bit bland. Power is provided by a 100W amplifier that Energy claims will produce dynamic peaks of 400W. The subs 8" driver features the same Ribbed Elliptical Surround as the RC-Minis woofer. In this case, the driver is made of a combination of polypropylene, ceramic, glass, and deposited mica. Its frequency response is rated at 27-120Hz, �B. On the rear of the S8.3 are inputs for low- and high-level connection. The variable low-pass crossover filter can be set from 50 to 110Hz and uses an 18dB/octave slope -- or the crossover can be bypassed and these adjustments made via a surround-sound receiver or processor. The phase is continuously variable, from -180 to +180 degrees. The volume control is on the front and easily accessible. But after Id got the volume set correctly, I never touched that dial again. I connected the RC-Minis and S8.3 to an NAD C372 integrated amplifier, fed upstream by a Simaudio Moon i5.3 CD player. Interconnects were AudioQuest Copperhead, and Nirvana Audio Royale speaker cables terminated in spades linked the NAD and RC-Minis. I connected the S8.3 to the same set of binding posts on the NAD using Ultralink Challenger cables terminated in banana plugs. First, I auditioned the RC-Minis on their own to assess their sound without the subwoofer delivering deep bass. The highs were lively and had excellent clarity, and the midrange and upper bass had very good control and resolve. I dont know if it was because of those Ribbed Elliptical Surrounds, but I found the sound very fast and tight, starting and stopping in an instant, and lending a good sense of rhythm to music. However, the bass was quite light, something Ill talk about more in a bit. The most notable characteristic of the RC-Minis sound was the forwardness of the midrange. I first noted this with singers, who seemed much closer to my listening chair than Im accustomed to hearing them. On Radioheads "Karma Police," from OK Computer [EMI Music Canada, 7243 8 55229 2 5], the RC-Minis positioned Thom Yorke in front of the rest of the music, as though he stood alone at the front of a stage only several feet away from me. It was as if a spotlight was being shone on him. This ability to separate an individual or an instrument from the sonic backdrop made the sound clean and open -- details became easier to discern. Even more striking, it gave the perception of depth on the soundstage. Recording venues, whether studio or cathedral, had good senses of spaciousness -- something not always found with speakers as inexpensive as these. Despite their diminutive size and limited bass, the RC-Minis could play plenty loud in my smallish room. I suspect their solid construction is a major reason for the RC-Minis clarity and ability to crank it out. However, without a subwoofer, they couldnt fill a large room with sound, and shouldnt be expected to. These are very small speakers. On their own, I think the RC-Minis could be quite satisfying in either an office or a bedroom system, where a sound closer to full-range isnt necessarily needed. At low volumes they positively shone, their clean sound making it easy to hear not just individual notes, but subtle changes in the volume of those notes. Retrieval of details was one of their strengths, and one strongly highlighted at low listening levels. Of course, the problem with a speaker this small is that it offers little in the way of bass; I suspect that the RC-Mini rolls off somewhere between 120 and 150Hz. The lowest frequencies it reproduced sounded tight and well damped, but in the absence of true deep bass, a great deal of information went missing that has a profound impact on the way I hear and feel music. I made a high-level connection to the S8.3 by simply running another set of speaker cables from the binding posts on the back of my amp to the posts on the sub. To best position the S8.3, I began by playing the opening movement, Sostenuto tranquillo ma cantabile, of David Zinman and the London Sinfoniettas performance of Henryk G髍eckis Symphony No.3 [Nonesuch, 79282-2]. It begins with double basses and contains the most sustained deep bass of any CD I own. In fact, the movement builds for over 13 minutes before soprano Dawn Upshaw enters. With this playing on the S8.3 and the RC-Minis disconnected, I followed some advice that Paul Barton of PSB had given me: I placed the sub at my listening position and moved around the room with my ears close to the floor, listening for where in the room the bass sounded best. When I found that position, I placed the sub there. As I moved into the corners of the room, I heard exactly what Barton had meant when he referred to corners as "bass traps." With the S8.3 at my listening position, there was no question that I could hear its greatest output in the corners. Unfortunately, that position so amplified the bass information that individual notes and pitches became muddled and homogenous -- while the bass felt powerful, changes in pitch were poorly defined. I could alleviate this lack of articulation to some degree by lowering the subs volume, but I didnt achieve a clear, open sound until Id positioned the S8.3 farther out into the room. It ended up between the RC-Minis, slightly closer to the left speaker than to the right. This put the sub 34" from the front wall and 48" from the nearest, left sidewall. From that point on, I never heard any bloat or congestion from the S8.3. I checked the instruction manual and followed Energys recommendation to cross the RC-Minis over to the sub at 100Hz. This worked well in my room, and I kept the crossover set at this point. My next step was to adjust the subs volume to achieve the smoothest blend with the RC-Minis. The ideal, of course, is that the output of the sub is so well integrated with the overall sound that it draws no attention to itself. Paul Barton had given me some other advice: that its usually best to set the subwoofer level as low as possible, to get the most seamless transition between the speakers. This was an understatement. I found that setting the sub volume properly made all the difference between its integrating seamlessly or its sticking out like a sore thumb. When the subs volume was too high, I could feel the power and weight of the bass -- it was impressive -- but I could also identify it as coming directly from the sub. When I turned the subs volume down, I could still hear it, but I couldnt point out where the low notes were coming from. In fact, it was remarkable how the S8.3s sound remained while its location "disappeared." If youre setting up a subwoofer and you find that it draws attention to itself and doesnt integrate well with the main speakers, its possible youve set its volume level too high. Initially, I thought the soundstage cast by the RC-Minis had lots of width and plenty of depth. But when I added the S8.3 subwoofer, the size of the stage not only increased, the space it occupied seemed more filled-in, providing a firmer foundation on which to block a more complete sonic drama. To test the Energy systems ability to play quick, bass-heavy music, I listened to Basement Jaxxs "Do Your Thing," from Subliminal Sessions Three [Subliminal SUBUSCD5] -- a track that features lots of fast, punchy electronic bass. The S8.3 accentuated everything I like about this song, primarily the energy and drive that propels it forward. There was no bloat or fluff -- the bass always remained tuneful and lightning-quick, but with plenty of impact. This is the sort of tune I might play at a house party, and I have no reservations in recommending the Energy system for such occasions. The sound had a certain "wow" factor in the way it got my attention and pulled me into what was happening on the soundstage. Anyone unaccustomed to high-end sound should be pleasantly surprised by what they hear. Another gem is Tori Amos 1994 release, Under the Pink [CD, Atlantic 82567-2]. The Energys sounded as good reproducing real instruments as they had with synthesized beats. Amoss acoustic piano in "Past the Mission" was as clear and lively as the drums that accompany her. As I listened to the Energys, it occurred to me that, with this system, the company had lived up to its name. The midrange forwardness gave the sound authority and vitality; these speakers were packing more muscle than their size gave them any right to. Hearing the two bands Low and Dirty Three perform their joint cover of Neil Youngs "Down By the River," from In the Fishtank 7 [CD, Koncurrent LC6110], I again appreciated what the Energy system could do in terms of casting an immense sonic landscape. Youngs music has been covered many times, but this one stands out because it deviates about as far as possible from the original. Rather than playing out the song like the rock anthem it is, this version of "Down By the River" plods along at a staggeringly slow pace, taking over five and a half minutes before the singer enters. During that period, the track builds steadily, from a murky background punctuated by sparse notes played on guitar, bass, and drums. Not until just before Mimi Parker starts to sing does the song really take shape. Prior to this, the musicians dont even seem to be playing together. One of the things I really like about this track is its sense of depth and openness -- the drone of the bass in a vast, empty space conjures a sense of isolation. On their own, the RC-Minis produced a good soundstage for "Down By the River." With the S8.3 added, the track was far more dense and filled out, becoming almost cavernous in comparison. Parkers voice was even and controlled, and the restraint and ease with which she sings will have you holding your breath. In contrast to the maddeningly slow pace of the Young cover, "Lordy" is like a raucous gospel tune. As Warren Elliss violin took over, the Energys agility was again highlighted, and the system gave this upbeat track all the spirit and clout it deserves. Energy has two more winners on their hands with the RC-Mini and S8.3 subwoofer. Each offers superb value, and, when set up properly, will perform remarkably well as a whole for the asking price. While plenty of good speaker options are available for $750, the RC-Mini and S8.3 are ideal for someone who wants compact, extremely attractive, high-quality speakers that can be placed discreetly on a bookshelf or stands, or mounted on a wall with the supplied brackets. Nor does such convenience come at the cost of good sound. If you take care in positioning the speakers and subwoofer -- something that wont cost you a penny -- youll be rewarded with a great sound.